Referee. 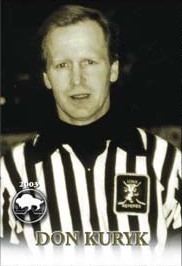 Born in Winnipeg, Kuryk was rated one of Manitoba's top level 6 referees in the game and officiated many crucial hockey games during a 35 year career. He officiated in the Winnipeg minor hockey system, MJHL, MMJHL, CIAU, WHL, IIHL, and worked in the World Hockey Championships, Allan, Centennial and Hardy Cup finals. Don Kuryk was also the referee-in-chief of the MJHL and the CIAU.